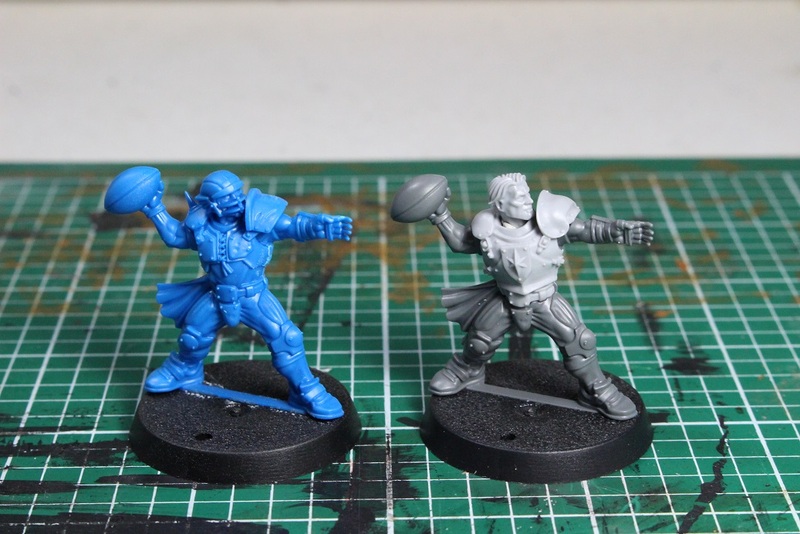 When Games Workshop announced the release of the Bright Crusaders team for Blood Bowl, there was quite a bit of grumbling across the interwebs. 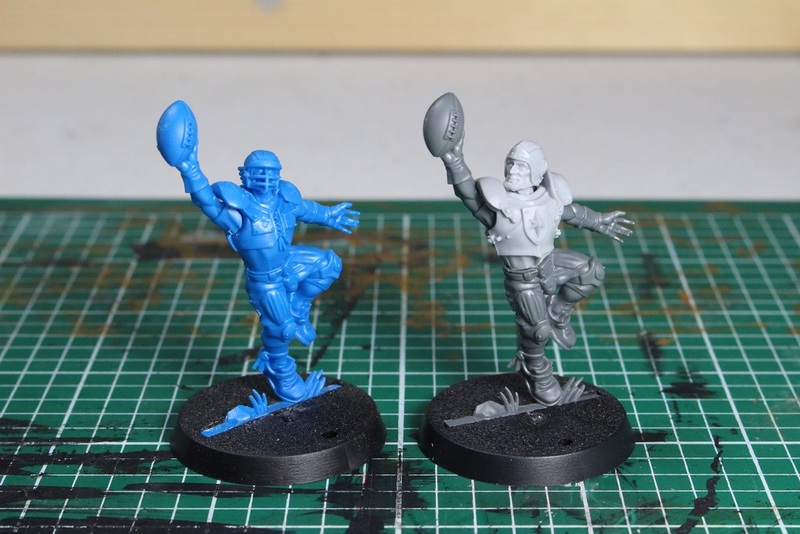 Some people were a little irritated that with only four official teams released for Blood Bowl, Games Workshop was now releasing a second Human team. 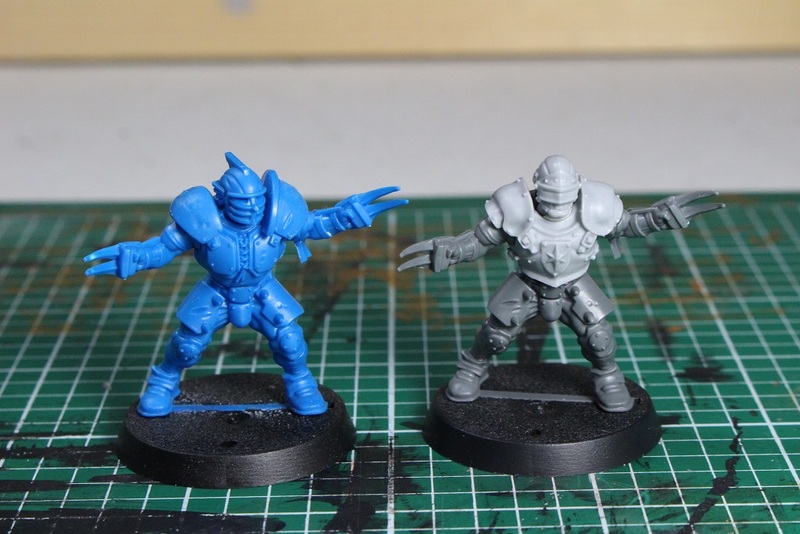 While I can sympathize with the feeling, I decided to go ahead and order the Bright Crusaders team from Forge World. 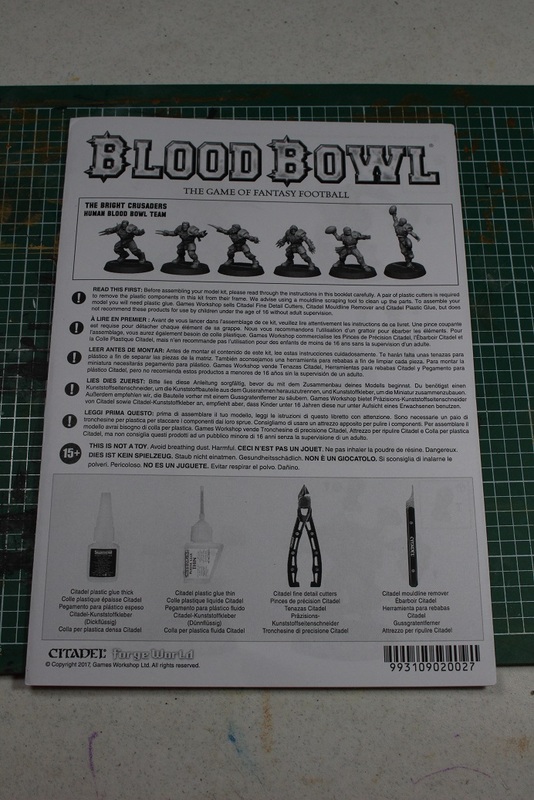 Well, a couple of days ago, a box from the UK arrived on my doorstep, so here we go with another Blood Bowl unboxing. 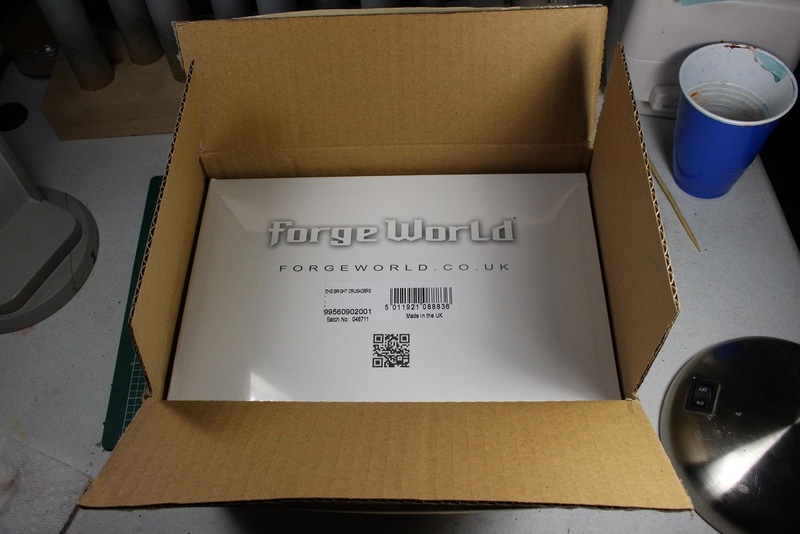 Another big white Forge World branded box. 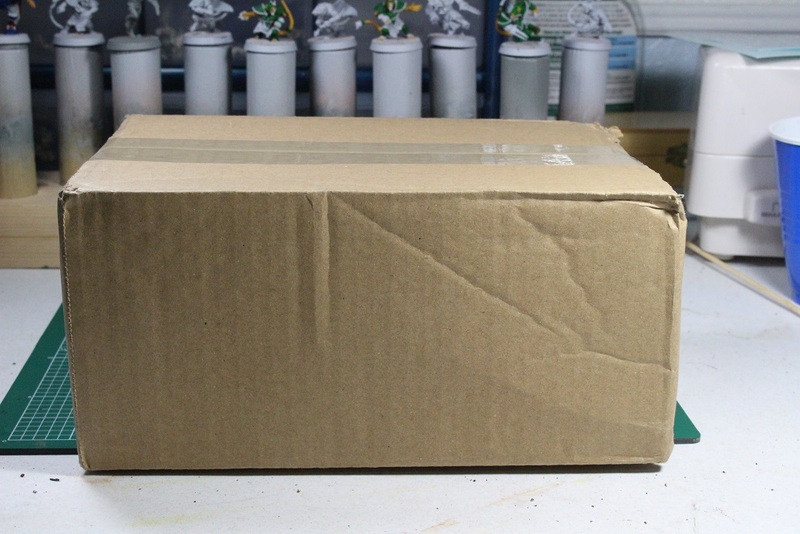 This one is about twice as deep as the Deathroller box was. The contents of the big white box. 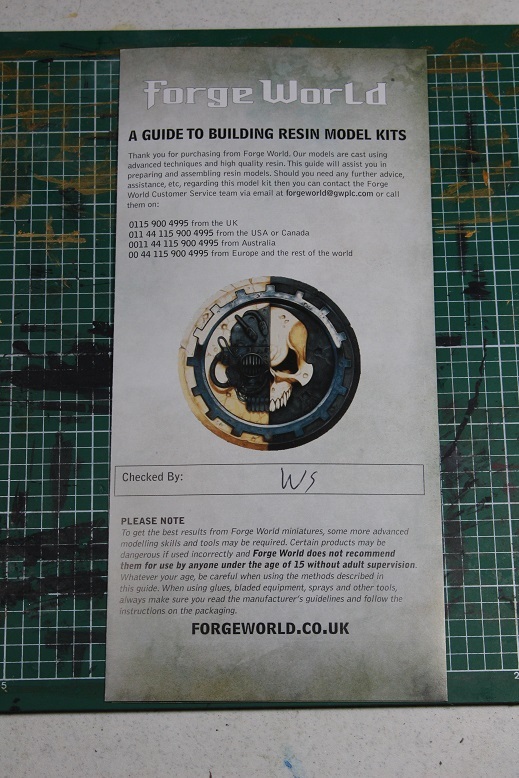 You get one of these resin model pamphlets just like in the Deathroller box. There is also a pamphlet for the team itself. 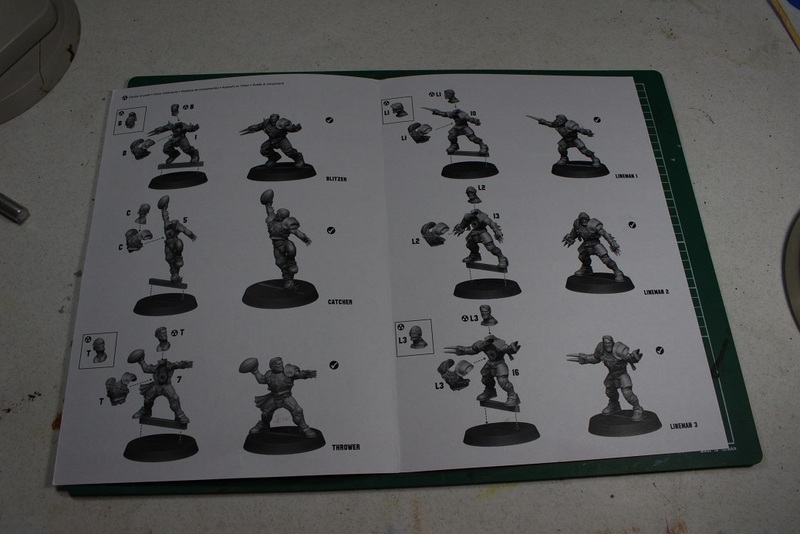 Inside are assembly instructions for the minis. 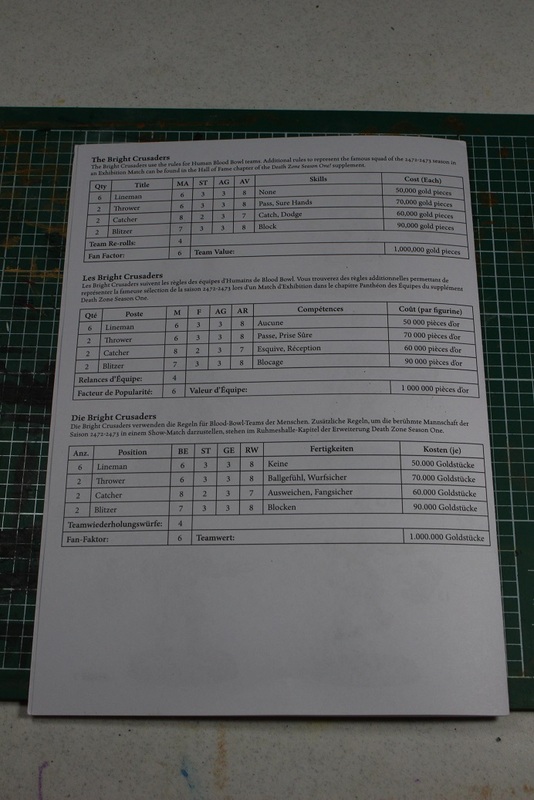 On the back is the instructions for building your roster. It is worth mentioning that there are no special rules for the Bright Crusaders. These are the standard Human team rules. 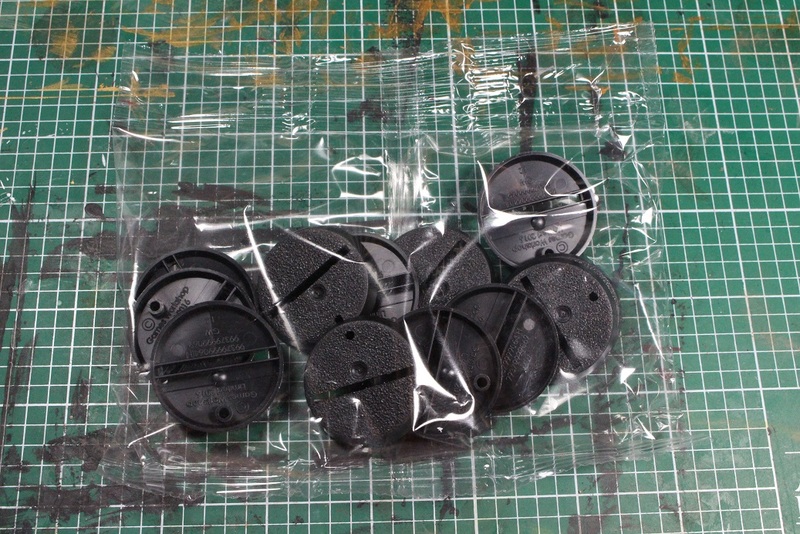 There are also twelve of the current standard 32mm round slotted bases. 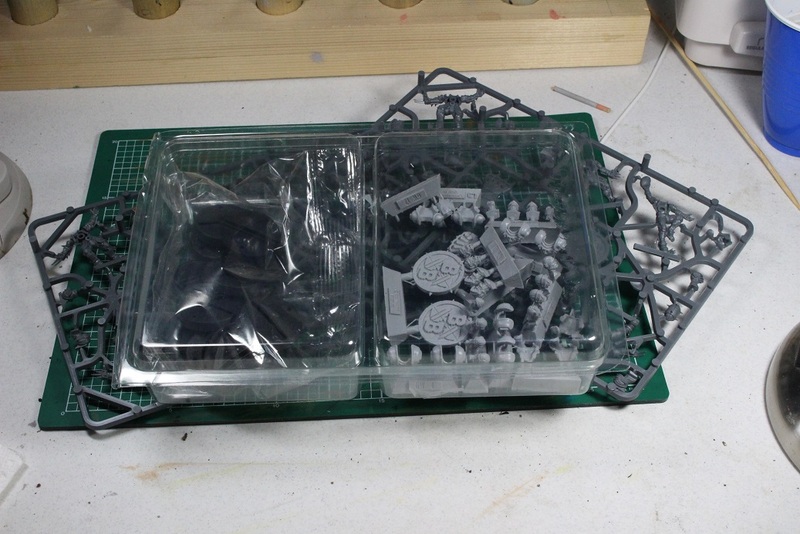 There are two standard plastic Human team sprues in the box. 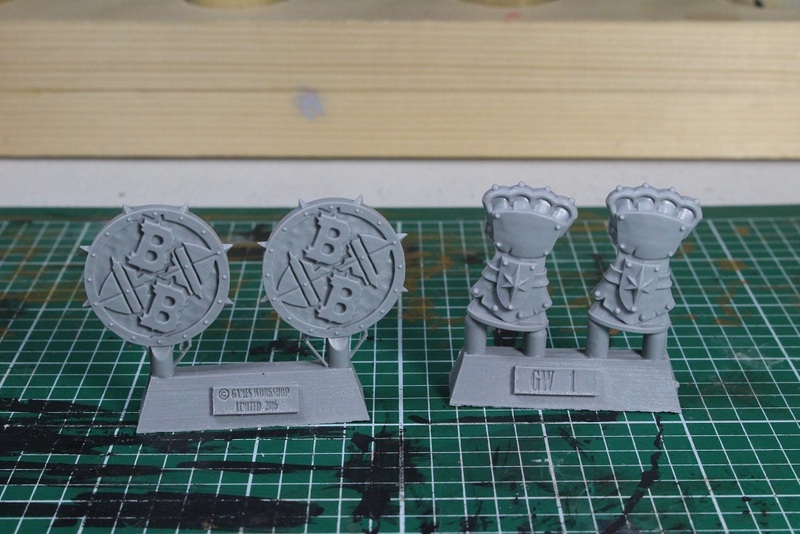 These are the same sprues that come in the Blood Bowl boxed set, as well as the Reikland Reavers box that is now available. 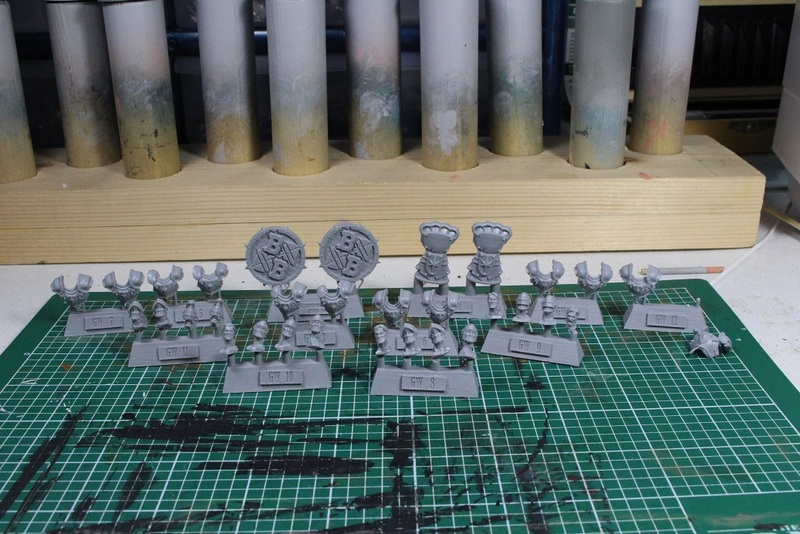 These are the official “Bright Crusaders” pieces to convert the standard Human, made from Forge World resin. 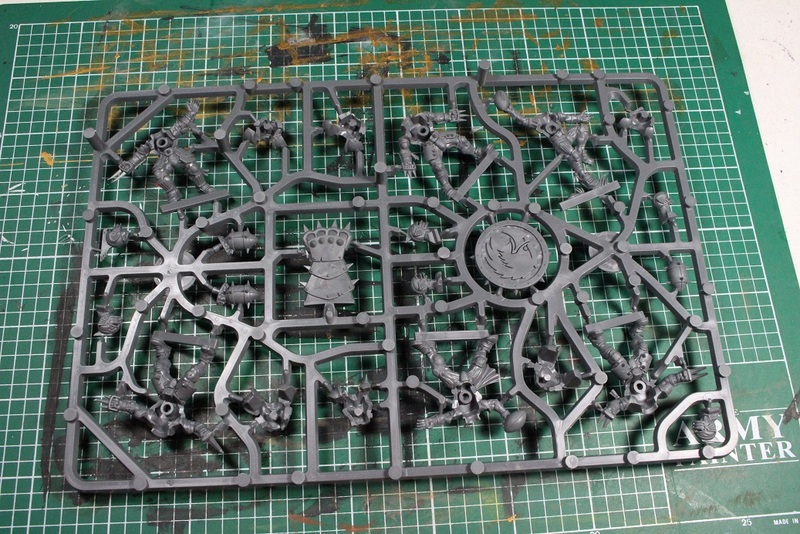 There are Bright Crusader specific counters in the box. Just enough difference from the standard counters to stand out. 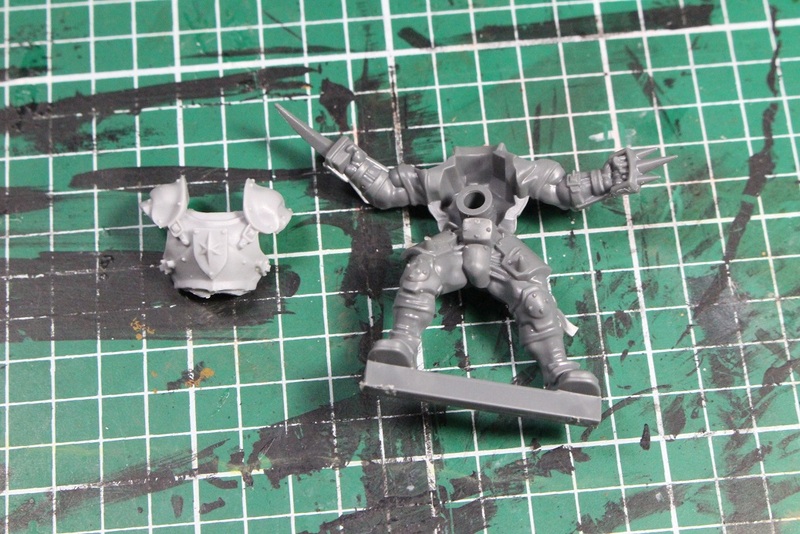 The pieces for the conversions include new chest plates with the big Bright Crusaders star in the center. 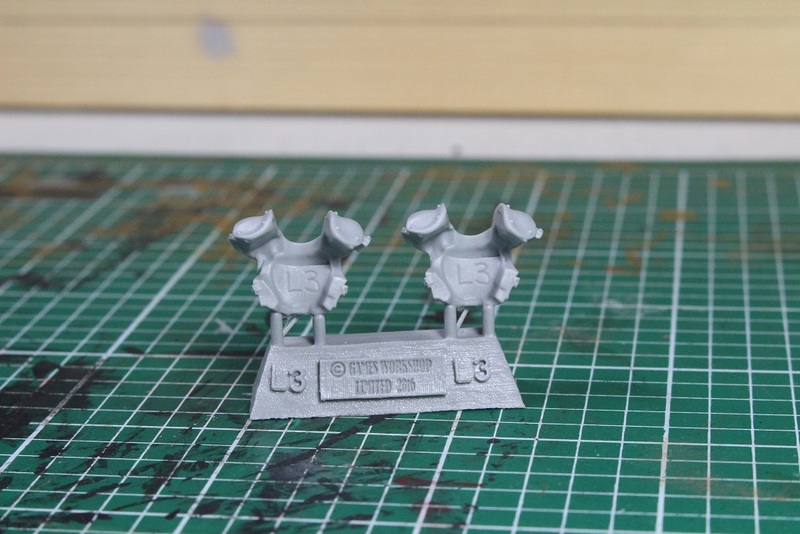 Each piece also has markings to let you know which mini they correspond to. 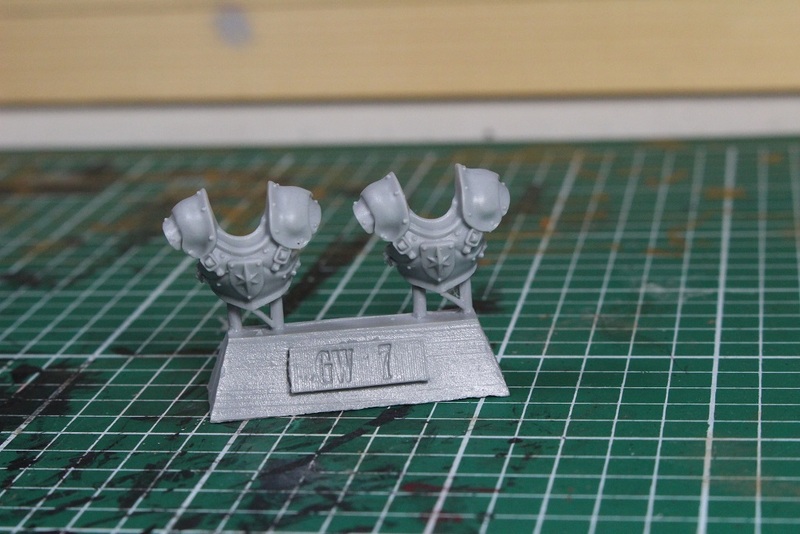 For instance, these chest plates go to Lineman 3. 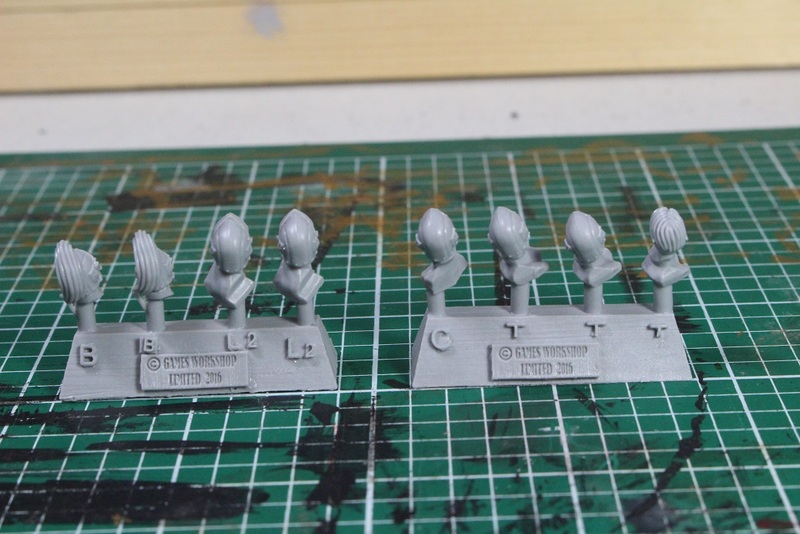 There are sixteen lantern jawed heads in the box. Some of them are repeats and afew of the same heads can even fit onto different bodies for a little variety. 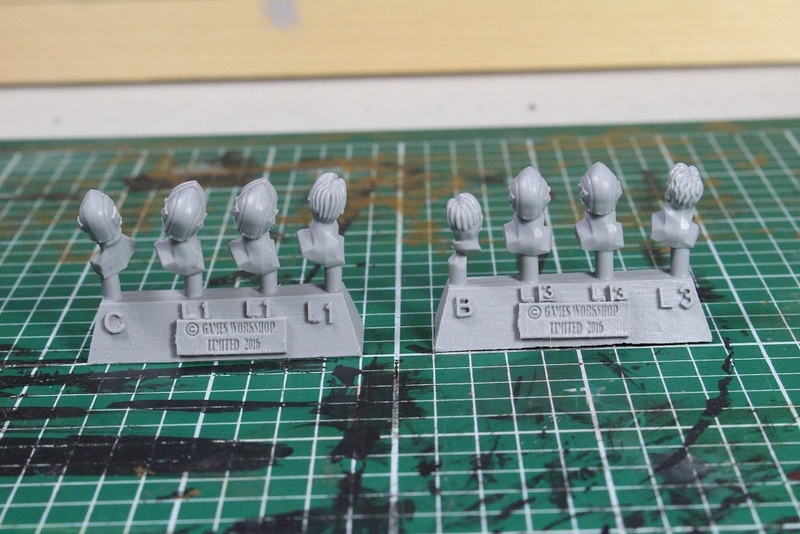 The rest of the heads. 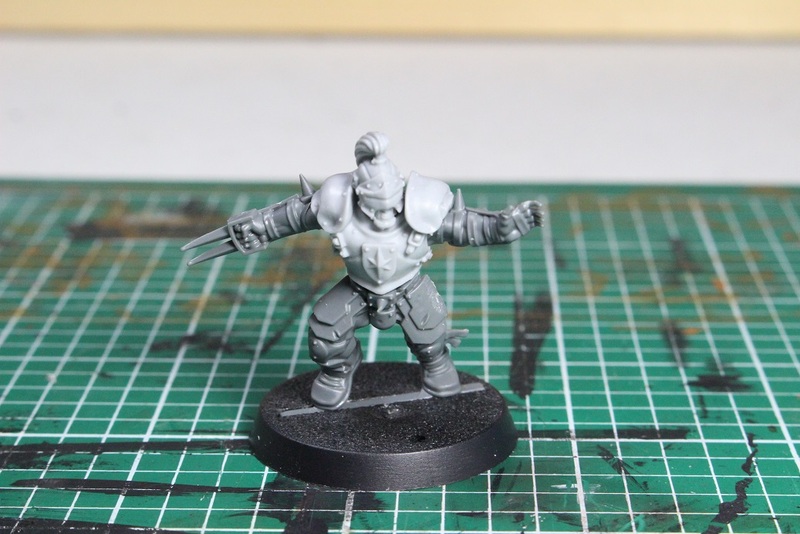 I am not going to put together every mini for this post as there are two of every pose. I will assemble one of each pose, though. 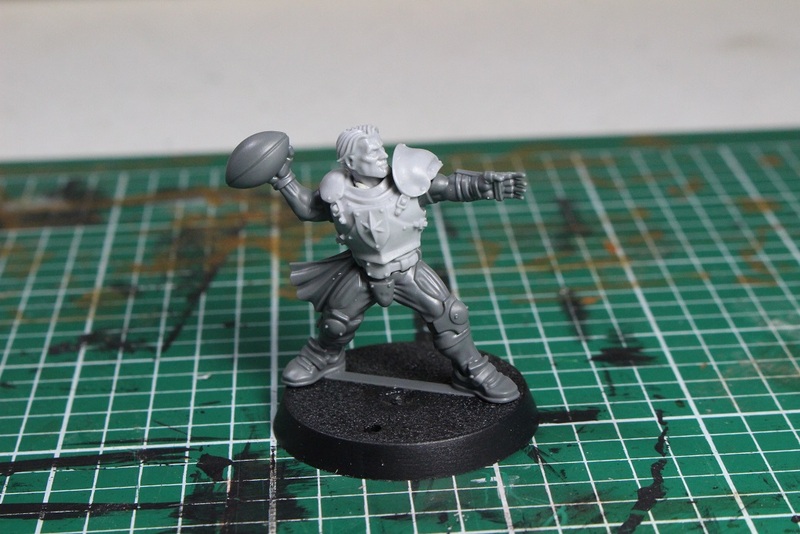 Since this chest plate happened to break off of the resin block during shipping, I decided to start with this Lineman. 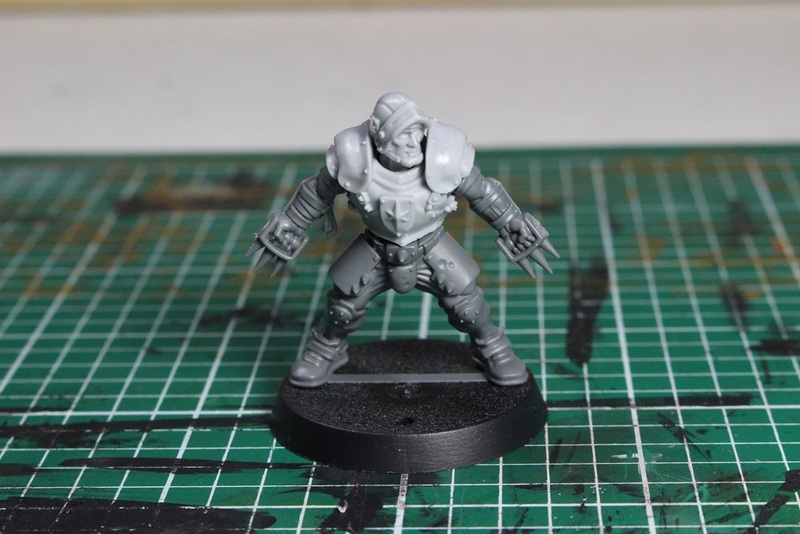 The existing Lineman body with the new chest plate. I chose a head without a helmet, because why not? 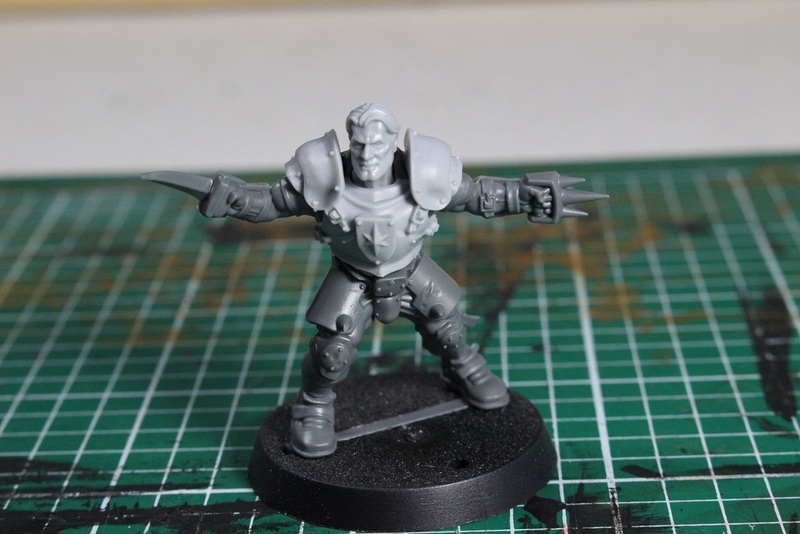 Here is the mini assembled. That is a chin that Bruce Campbell himself would be proud of! 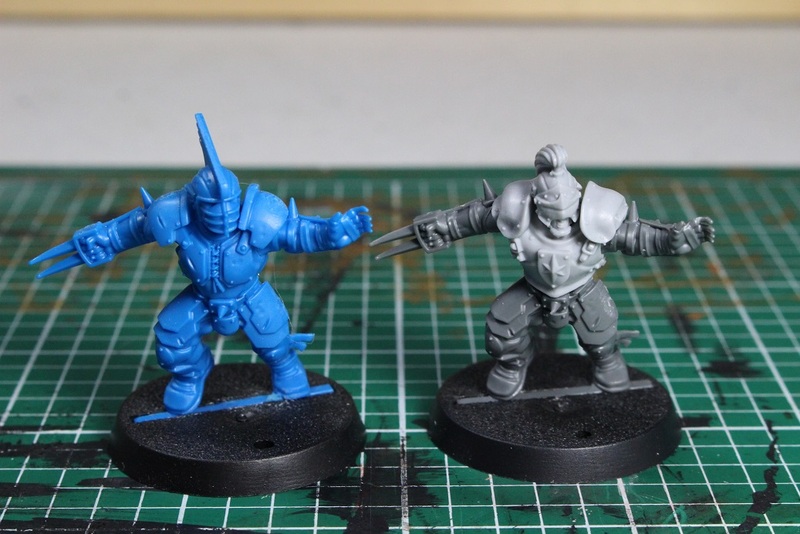 Here is the Bright Crusader version of the mini directly next to the Reikland Reaver version of the same mini. It is the same pose, but I think the new kit is enough to make a difference. I do not think I will make two different teams with them. 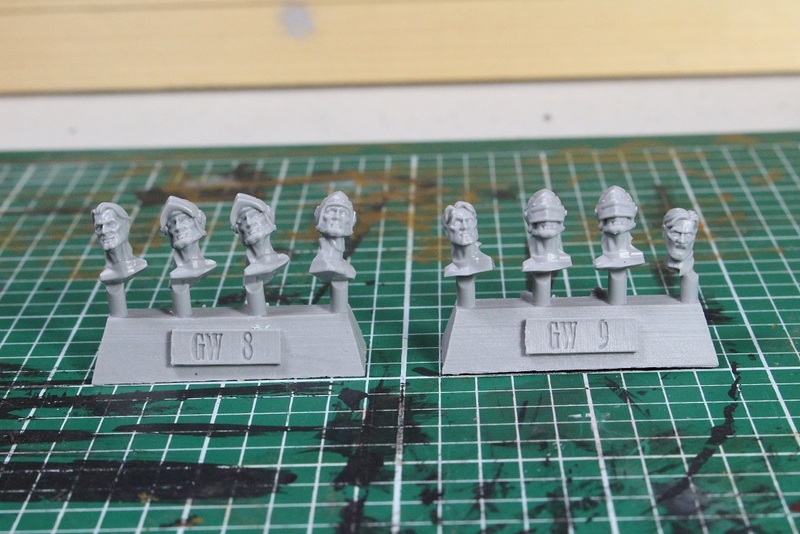 My plan is to use the Bright Crusader heads to add a little variation to the existing Human team from the boxed set. 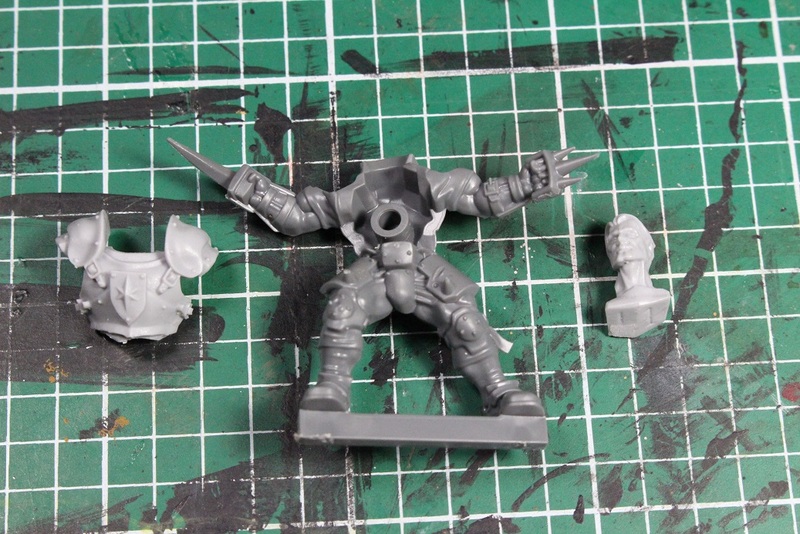 Here is the mini with the old chest plate and the new head. Gives a little variation to the mini. More variation can easily be achieved by simple mods such as filing down some of the spikes and punch daggers. They do not really need that many spiky, pointy bits anyway. Here is the next Lineman. 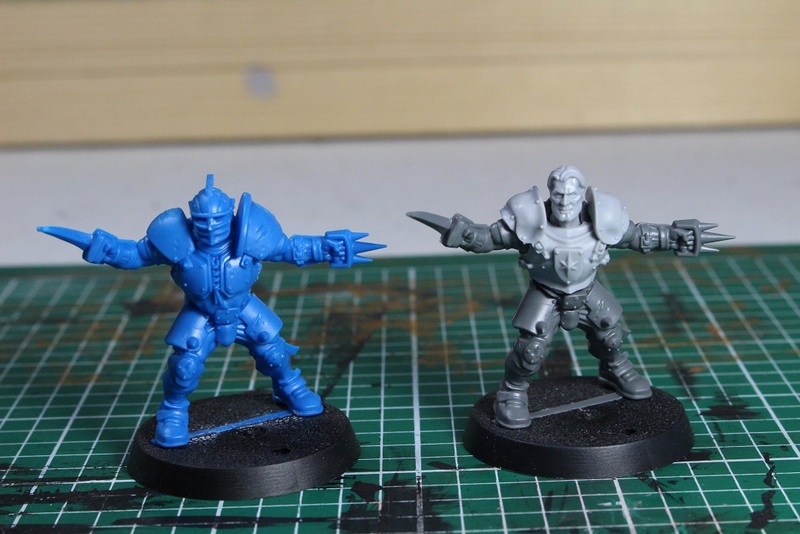 The mini compared to the original. Time to move on to the positional players. 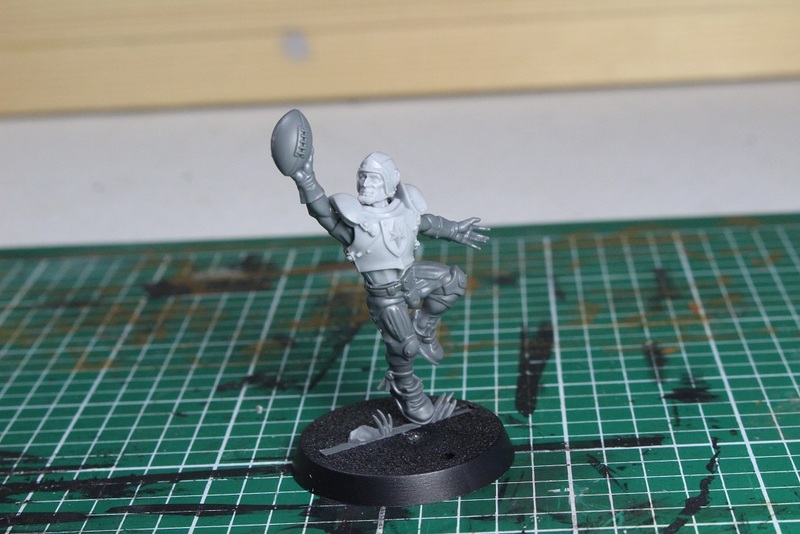 This is the Bright Crusaders Blitzer. 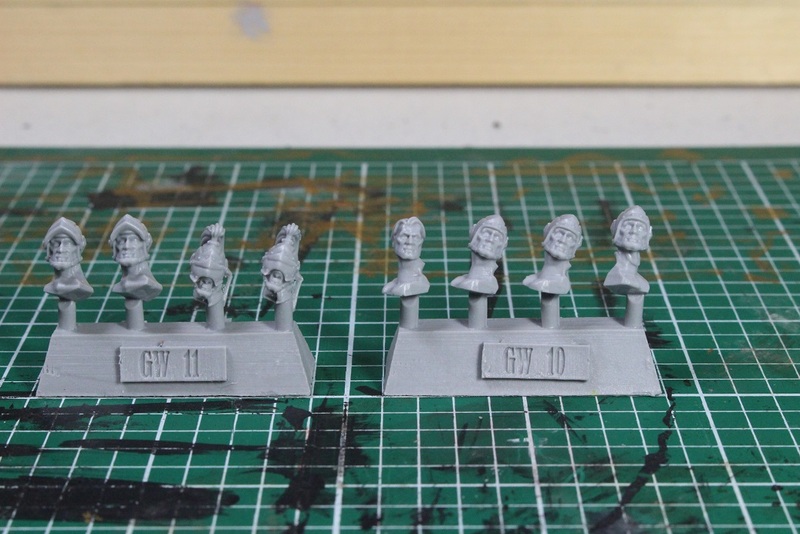 I kind of like how several of the heads are even held at different angles than the original heads. 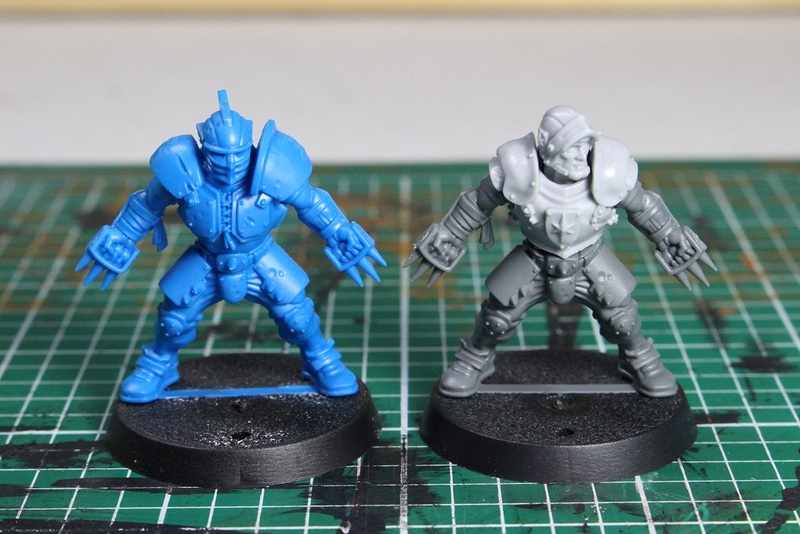 It manages to add a little more variety to the minis. The Thrower complete with flowing hair blowing in the breeze. The last comparison shot. 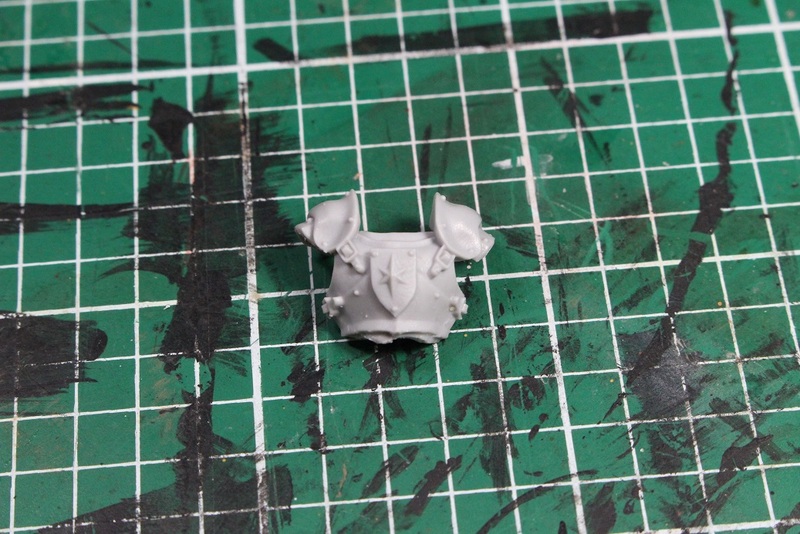 The head provides a nice alternate look for the mini. And that pretty much wraps it up for this post. It is a shorter post, but there is not a whole lot new to show off here. 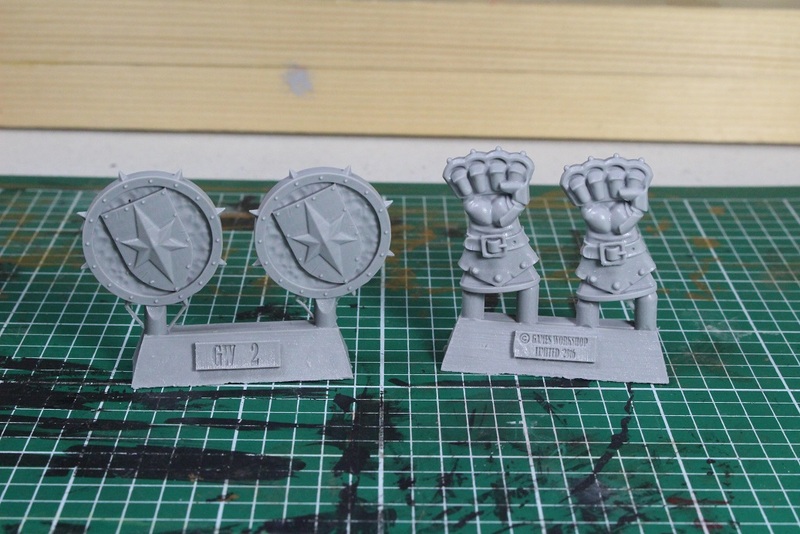 Just a few new pieces to add to the existing minis. 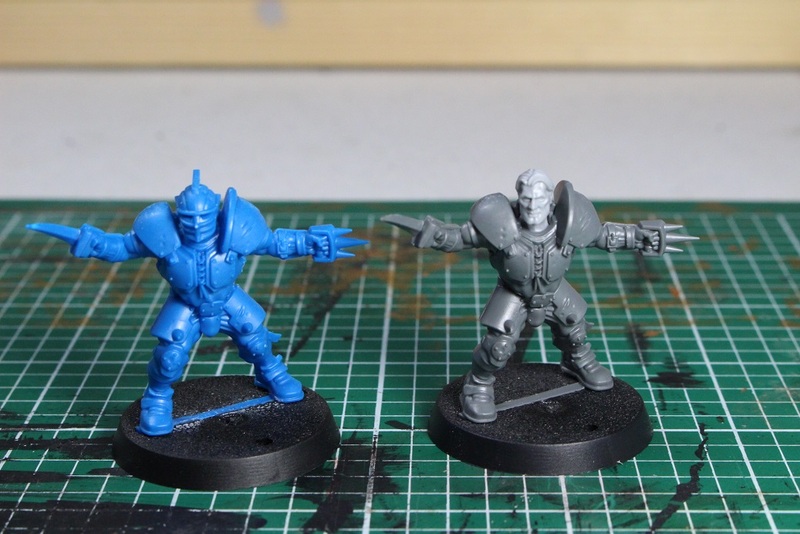 According to a recent post on the Warhammer Community website, the first of the team booster packs meant to fill out positionals should be available soon. With that, I guess it might not be completely necessary to use these pieces to add variation to the existing Human team, but it is an option for people to consider. 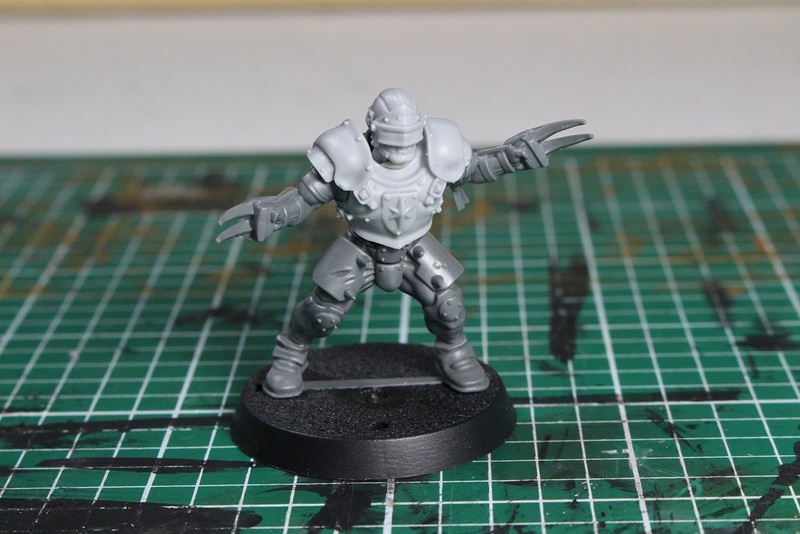 This entry was posted in Blood Bowl, Gaming and tagged Blood Bowl, Bright Crusaders, Forge World, Forgeworld, Games Workshop, gaming, Miniatures, table-top games, tabletop wargames, wargames, Wargaming by Mike C. Bookmark the permalink. I’m not sure of these. The price seems a little high for me. 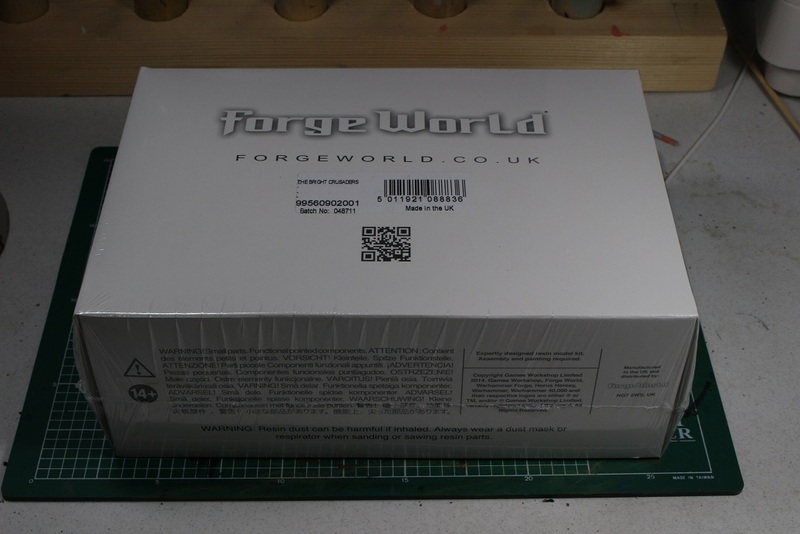 Better if forge world did a team from the beginning. I think I pretty much agree with everything you said here. I was originally going to skip this release, but then I caved when I started thinking about how I could use the pieces to create a little variety in my players.